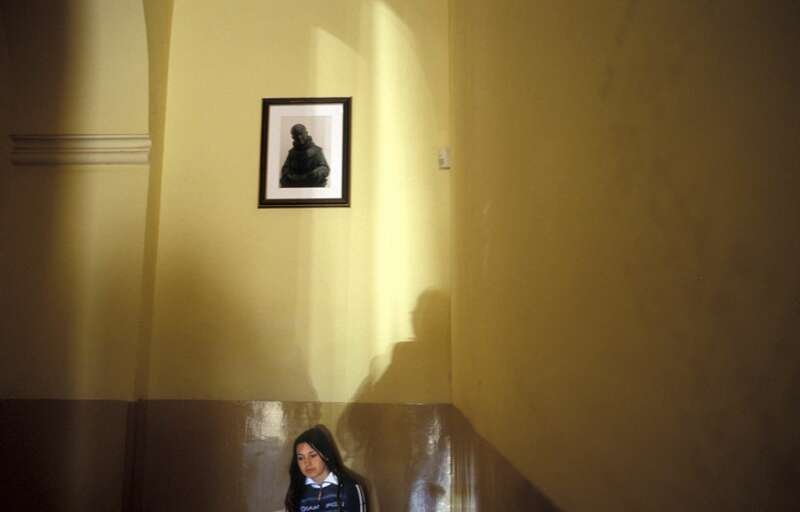 A high school student sits in the hallway of Mostar\'s main high school, or gymnasium. Before the war, the school had a multi-religious student body, but after the war local Croats renamed the school after a Catholic priest (whose portrait hangs on the wall) and incorporated religious teachings in to the curriculum. Re-integrating the school, and renaming it the Mostar Gymnasium, took years of effort. By 2004, Muslim students had returned to the school, but were taught in separate classrooms. Education -- particularly curriculum for history and religion -- remains one of the most difficult post-conflict issues in the country.